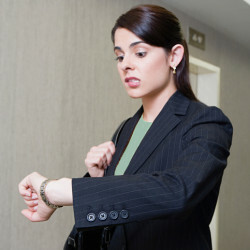 Running late for an interview is no laughing matter, but how can you repair the damage? The recruiting department can help by letting your hiring manager know you are behind, but it is up to you to make amends. The first thing you should do when you realize you are going to be late is call your recruiter or your contact at the business. Let the contact know why you are behind schedule, apologize, and provide the earliest time you can be there. This helps the company’s staff prioritize and work around your delay. If you show up 30 minutes late and don’t inform anyone, the hiring manager may need to leave for a meeting, or may not care to conduct the interview anymore. Be courteous and work around schedule changes your interviewer may need to accommodate your interview. It is easy to look frazzled, messy, or disorganized when running behind schedule. Even if you are just late due to a traffic jam, the stress can affect your behavior. Take a second to breathe, check your outfit, ensure you have your interview materials, then walk inside. When you meet with the hiring manager, apologize for being late and for any inconvenience it may have caused. Smile, and let the manager know you are excited to be there for the interview. Don’t dwell on being late for long, and instead focus on the interview itself. After you are done closing the interview, think of preventative measures you can take for your next interview. Look into setting your outfit out the night before, or leaving more time for traffic or road conditions. Leave early, be there on-time, and be ready to answer any questions your interviewer may have.